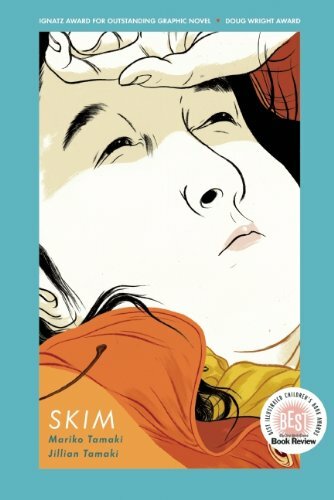 Skim, published by Groundwood Books, is the debut graphic novel written by cousins Mariko (author) and Jillian Tamaki (illustrator). The setting is in an all-girls school and the protagonist is Kimberly Keiko Cameron, aka “Skim”. The graphic novel centres largely on Skim as she reveals in her diary her growing pains, friendships, death and loss, and infatuation with her teacher. It is a poignant coming of age story. Beautifully illustrated, Jillian Tamaki is the perfect choice for the graphic novel. I have been a fan of her works since she published her series of illustrations “Gilded Lilies” in 2006. She is a much sought after illustrator for book covers, magazines and editorial illustrations. With Skim, she has taken her art to another level. The artworks, done with brush pen, add to the exquisite feel of the graphic novel. She maintains a good balance between the words and crafting out each panel for the readers to fully appreciate both. And when she needs to do a full spread in the graphic novel, the result is eye candy, thanks to her clever use of composition, tones and fluid brush line work. The book is lavishly filled with such spreads. The dialogue is realistically written and depicts growing pains vividly. The reception to the graphic novel has been outstanding. It won the 2008 Ignatz Award for Outstanding Graphic Novel and was nominated in four categories in the 2009 Eisner Awards. It also won Best Book at the 2009 Doug Wright Awards.